This tutorial demonstrates how to create a Twitter header that will also fit as a Facebook cover photo for a Facebook page or profile. Theresa Santa from iBrand Your Business will take you through the steps of how to use http://canva.com. 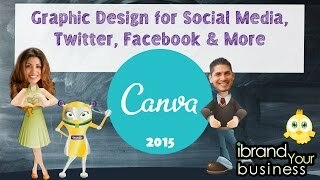 This video provides step by step instructions with great detail to help viewers understand Canva.com and some basic graphic design. Now anyone can create their own social media posts, social media headers, and other helpful graphic design templates with the unique and innovative website, canva.com. The video will demonstrate where to find other available options on Canva to create a variety of different graphics. Thank you for watching. Make sure to subscribe for other useful upcoming tutorials. Hi Theresa, Thanks, your doing great, much educational and you make ways easy to use. how to to this design in facebook page? Great information. How do I share a facebook post design to my business page without posting it to my personal? Hi, cool video, congrats! Would you do a video with https://flimbo.io ? I love this video! I thought I was pretty good with Canva but as usual you taught me something new in an easy to understand format. Thank you iBrand Your Business!! !